Testing new blog editor, Zoundry. 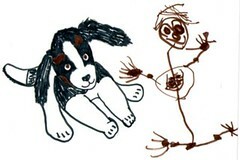 The above picture is something my daughter and I drew a few weeks ago...a picture of her with her toy dog Danny. Just testing the picture insertion feature of this editor.